Now through Nov 17th, enjoy 20% OFF all Foil Stationery and Cards with code FOIL2014. Foil-pressed designs are available for wedding invitations, save the dates and day off pieces (place cards, menus, programs and more)! 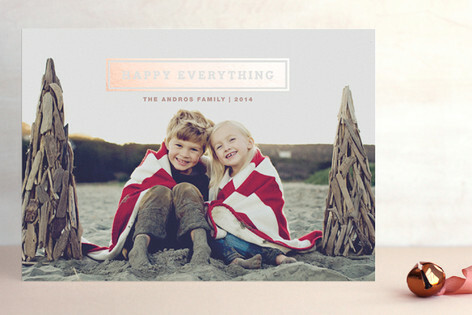 Minted also got many gorgeous holiday card designs this year, including the Newlywed Holiday Card collection. Check it out today!. There's still time if you order from Tiny Prints by tomorrow. That is the absolute last day to use their Super Rush shipping and guarantee delivery by Christmas Day. Just because you are waiting until the last minute doesn't mean the cards have to be generic or boring. With Tiny Prints, even in the rush, you can take a few moments to personalize the cards. You can upload some pictures, change the font and text, and make your cards stand out, even if they arrive just in time. If you are giving them in person, you can have them delivered to you so that you can write in them and hand them out. If you are mailing them, you won't be able to write in them, but at least you can have Tiny Prints mail them for you. You can even have some sent to you and some mailed for you. Just because you waited until the last minute doesn't mean you have to send bad cards. Head on over to Tiny Prints now. A deal that last all weekend long! Save 20% off all orders (no minimum) at Tiny Prints with coupon code 20NOVSW during checkout. This deal starts 11/21/2012 and last till 11/25/2012. Pick your card here!